Gregorio M. Toral is the founder and CEO of Ciclogreen, the online platform that allows city councils, companies and universities to reward their employees and students with free gifts for using sustainable means of transport to go to work. Gregorio (Seville, Spain) has a PhD in Biology (Spanish National Research Council) and is a member of the technical committee of the bicycle industry working group of the Spanish National Congress of the Environment and participates as invited speaker in numerous international congresses on innovation and green entrepreneurship (CONAMA, South Summit, GreenECONet and others). Can you tell us how the idea for your startup began? After finishing my PhD, I was looking for a better way to have a positive environmental and social impact related to my work. I detected a great business opportunity inspired by a successful company in USA, Recyclebank, which applies gamification elements (Rewards, Points) to promote recycling among citizens. As a researcher I was very aware about the importance of fighting climate change and air pollution in cities, so I decided to apply similar gamification elements and new ones to promote sustainable mobility for the first time in Spain, as a way to reduce CO2 emission and air pollution. The first version of the web of Ciclogreen was released in June 2014 targeting the general publics and aiming to increase local business visibility through Ciclogreen ‘Reward Catalogue’. Thanks to local acceleration programmes, we created a balanced team plenty of energy to build a state of the art solution. In later 2015, a few companies requested our solution to deploy it inside their companies to promote the use of cycling and walking to work from their employees. Taking into account this market demand, Ciclogreen pivoted towards a Software as a Service solution focused on corporations and public administrations. We validated our business model with customers and started to grow, adding new functionalities ,data visualization and data analysis tools to the platform. We have been working as a team for more than 3 years. Now the team is growing with great people that is helping us to constantly improve our solution. What are you really passionate about achieving? We want to be the first option for city councils and companies that are looking for a tool to promote sustainable mobility practices and analyze mobility patterns to improve infrastructures and services. We want to help city councils and companies to make a difference fighting climate change and reducing air pollution to create more livable cities around the world. Who is in your team? Where are you all from and what backgrounds do you have? We are a multidisciplinary team of 6 people from Spain and Brazil. 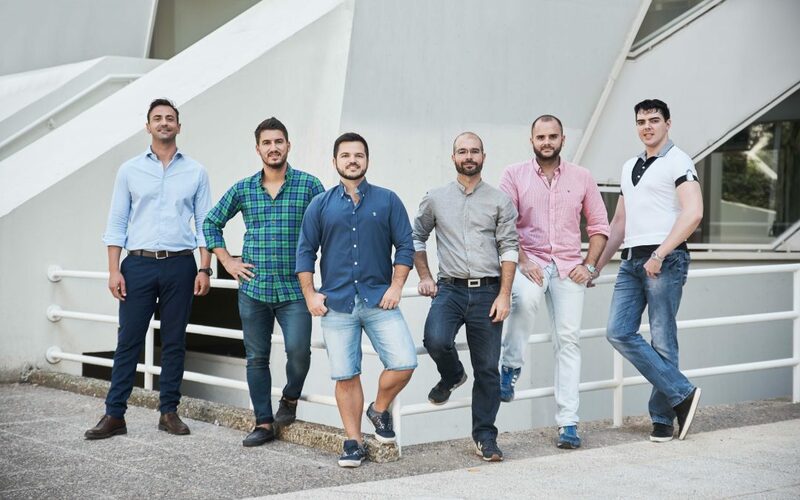 We have extensive experience not only in project management (Andoni Recabarren, COO and Gregorio M. Toral, CEO), software development and data analysis (Francisco J. Melgar, CTO and Álvaro Otero, Android and iOS Developer), but also in commercialization (Flávio H. Ferreira, Chief Sales Manager) and marketing and communication (José M. Rodríguez, CMO). We really love what we do in Ciclogreen and enjoy doing our best to provide the best solution to solve real problems related to mobility. What challenge have you selected for the EDI incubation programme and why did you choose it? We have selected the Challenge Optimisation of traffic flow in Berlin (EDI-2018-7-TUB) because it is exactly the kind of challenge we want to solve in cities to help city planners to improve infraestructures and services. Besides, we love Berlin, is a city that is a reference in sustainable mobility and we want to be part of its evolution. Now is time to add new analysis capabilities to our solution, specially the ability to make traffic flow predictions, a functionality usually demanded by mobility technicians and city planners, our customers. What are you most excited about taking part in the incubation programme? EDI will allow us to increase the analysis power of our solution, improving it, making it more attractive to our customers and investors. This opportunity arrives at the right moment for us, since we are currently getting feedback from our customers about our Transportation Heatmaps and have closed our first investment round. We have the right team to grow thanks to EDI and will get the most of this opportunity to become the new international refence in providing big data mobility analysis solutions to solve traffic related problems in cities. What unique aspects does Ciclogreen have to offer the big data ecosystem in Europe? Ciclogreen is already a reference in providing solutions to specifically promote sustainable mobility in companies, universities and city councils, including all sustainable means of transport. Our competitors are mostly focused on rewarding sports, specially cycling. We provide an online reward system and access to an online Transportation Heatmap, including mobility pattern visualization, to our customers so they can promote sustainable mobility activities thanks to gamification elements (ranking, points, Mobility Challenges and rewards) while at the same time get detailed information about their employees’/citizens’ mobility behaviour (anonimously) to develop sustainable mobility plans and take urban planning decisions. In 2017, we were selected as one of the companies to join the first FIWARE mentoring programme at Fiware Zone in Seville, Spain (https://fiware.zone/). We have developed new Fiware-based functionalities aimed to solve smart cities mobility challenges thanks to the acceleration programme FrontierCities2, including our ‘Sustainable Transportation Heatmaps’ (e.g. www.ciclogreen.com/smartcities). Our solution is already at the Fiware Marketplace (marketplace.fiware.org/pages/solutions/b6b4b03f1d65ce7c8983f43b) and our mobility data visualization and analysis tool (‘Transportation Heatmaps) has been really appreciated by mobility technicians like those from the City Council of Barcelona. Fiware is helping us to build a unique solution to promote sustainable mobility that at the same time is universal, it works for every city in the world. You can watch a 30 second video on Ciclogreen in their EDI portfolio.